Every time you get in and out of your Jeep Wrangler, it's another opportunity for scratches to mar the interior door sills. 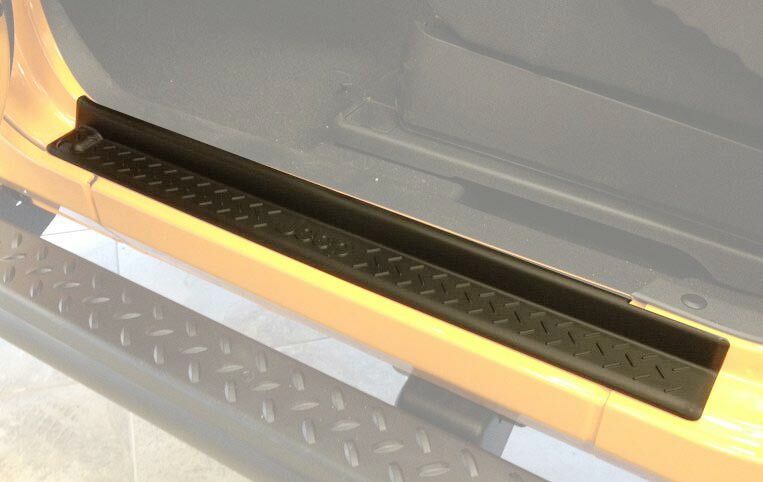 You can protect this high-traffic area and add a finished, stylish look to your Wrangler by adding a set of door sill guards. 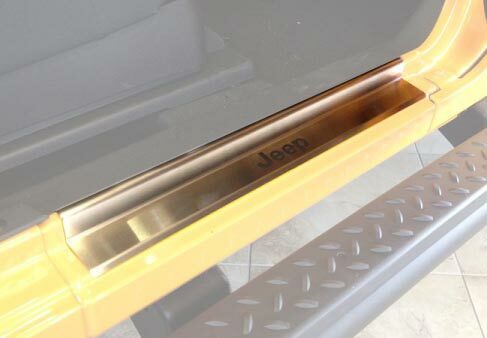 These door sill guards are available for both two-door and four-door Wranglers in two versions: a black plastic and a bright stainless steel, both of which feature the Jeep logo. Order the part number you want from the list below. Conssticky taped on, don't wrap over sill seam. Easy to install in about 5 minutes. Looks great and the Jeep logo sets them off. Very nice. Went on easy and looks great. Sill covers are well made, fit as they should and were simple to install; only took a few minutes on each side. These are not visible from the outside when the door is closed. The cross hatch pattern closely matches factory side steps. Very pleased with these entry guards. They are super easy to install and are perfect for keeping your paint from getting scratched when getting in and out. They are a very good quality. Mine have been on our 2016 for over a year and I am about to get a second set for my new 2017 JKU. Very sharp looking, will help save the paint of wear and tear. The band fits well, I just hope the sticky band last long. These are great, give your Jeep that added dash and protect it from rubbing all the paint as you get in and out. Super easy to install, just peel and stick. Upon receipt of the sill guards, I carefully sighted along the edges to ensure that they were molded straight. One was not, so I requested a swap-out with a straight one. The customer service person was very helpful and willing to find one in stock that was straight. After noting where the sill guards should go at each door sill, I carefully cleaned one sill surface at a time, and rubbed thoroughly with an included alcohol wipe. After drying, I removed the protective tape strip and carefully aligned the guard to where I had determined it should be affixed. I then affixed the guard and applied finger pressure along the taped area for about a minute. They are on and look great! Incidentally, I did a "dry run" with each guard to ensure each door would close properly once the guard was taped down. Easy to install fits great. Very easy install, perfect fit and finish. Great product. ProsEasy to install. Factory OEM fit, finish. They look GREAT! installed quickly and easily. part location is stamped to avoid any possible confusion about placement. Proswell made product, tape seems more than suitable to last. Easy to install. Matches my factory side steps. ProsDoes a great job of protecting my door stills. Very easy to install. I really like the look!! I added marine adhesive to assure they stayed in place. Didn't completely trust the double sided tape. Easy fit, Added Marine adhesive to assure they stayed in place. ConsDouble sided tape to adhere will fail in due time. I just recently installed this equipment due to cold weather for the last few months in the northeast. It fits very well work to do. Very add-on to my new jeep!!! Came with easy to follow instructions and they look great! They will definitely help to protect the doorway. a must for the wrangler, good price and easy to install, they really help to keep the paint door sill from getting scratched and nicked. Just recieved my Mopar Jeep Entry Guards for a 2014 Unlimited. They are better that I thought they would be. They look great and Just For Jeeps has the best prices of quality Mopar Parts. Will order from them again.